I think this deserves a Ta Dah!! 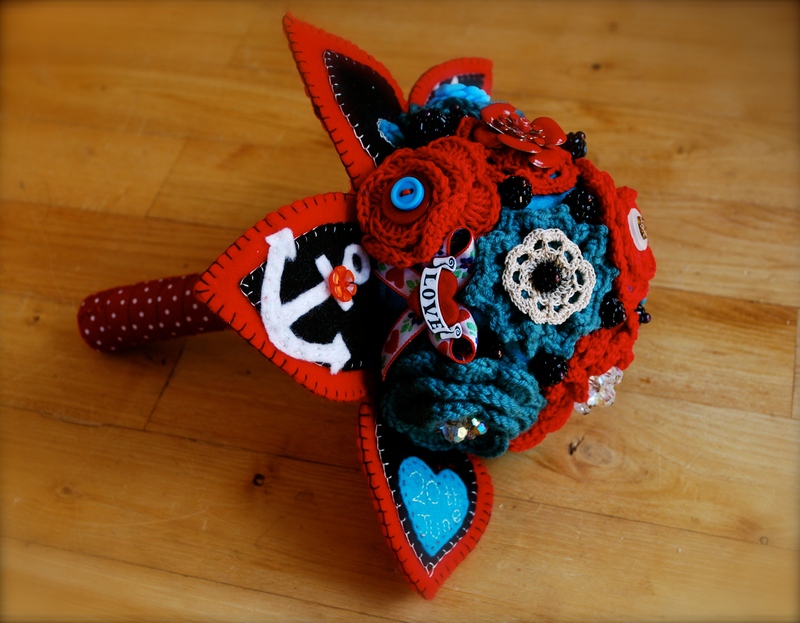 I LOVED making this wedding bouquet for my dear friends Caris and Steve. This has been a special commission for me and it seems like an age ago that Caris and I first discussed her wedding bouquet. I am SO excited that I finally get to write about it and share pictures of a very special day. This was never going to be a conventional wedding: think Mexican Day of the Dead, tattoos, circus, red and turquoise vintage net frock, giant yurt and flamingos. It was a lot of fun. Henry and I contributed in various ways including providing the giant yurt (this is what I do in my day job) as part of our family business Yurtmaker. I also made crochet bouquets for the bride and the bridesmaid, and a crochet shawl for the bride. I warn you all, there a number of wedding related posts coming up…. So, I started with the theme of red and turquoise, a pile of broken jewellery, buttons and bits. I made a number of crochet flowers from memory and made other bits up as I went along. Not all of these made the final cut as, at the last minute, we realised that I had had leaned more towards the teal and away from the turquoise. Nothing short of perfection would do for this one. 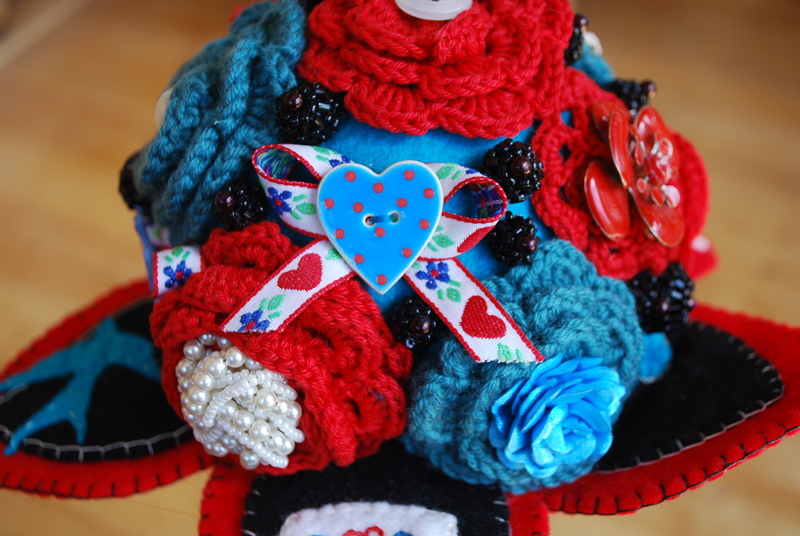 The bouquet is constructed mainly from felt around a polstyrene ball and a bit of wooden dowel. I appliquéd the leaves with felt designs that are personal to the bride and groom including the date of wedding (which is another thing I got wrong the first time, must pay more attention). The bits of jewellery, beads and buttons are all things that are personal to Caris. I spent a lot of time pinning and repinning all the various bits in different positions to make sure that it was exactly right for her. This is actually more of an embroidery/sewing project than a crochet project, but I think the crochet roses look really effective. It also really appeals to me that she will be able to keep the bouquet for ever. She did declare that she was throwing it nowhere! It was such a fun thing to make and it is great to see something I have made playing a small part in a big day. I love this and look forward to seeing a lot more!! It’s gorgeous. I really wish someone would ask me to make something like that.